Suffragist, Katy B Plummer’s solo exhibition, is like finding a forgotten space backstage to a theatre. Curiosity comes quickly: sculptural pieces seem to spin-forth from the title video installation into the gallery space and down the stairs. Plummer’s show is a multimedia retelling of the early twentieth-century British Suffragettes. There’s a narrative that binds the show. We enter the mind of a protagonist dealing with an inner resistance to her transformation from domestic homemaker to revolutionary bomb-maker. Packed into each sculptural piece—robotic furniture, tapestry, ceramics—is a radical politics with some serious questions to boot: What does it mean, especially for a woman, to embody radicalism? What is the potential of violence in revolution? What is violence in revolution? Plummer’s show has many elements of a tragicomedy, which effectively draws us in closer to the hard-core politics and questioning going on here. Comedy also stresses the tragedy of patriarchy’s rewrite concerning the Suffragettes. These fighting women became cookie-cutout characters over time, remembered as few in number, pushing pamphlets here and there, who made a fuss over women’s right to vote between their domestic ‘responsibilities’. With mottos like ‘deeds, not words’, these women had militant agendas that went beyond gaining the vote. Prominent speakers had jujitsu-trained female body guards who fought the police. They made bombs and set fire to houses. When they were arrested they went on hunger strikes in prison. They were force-fed (possibly for fears of martyrdom and more media coverage). Approximately one thousand British Suffragettes were imprisoned before WWI. Women died fighting for equal rights. During the opening, Plummer pulls me aside: ‘Let me tell you about guns … .’ And, then, ‘What about violent revolution’? 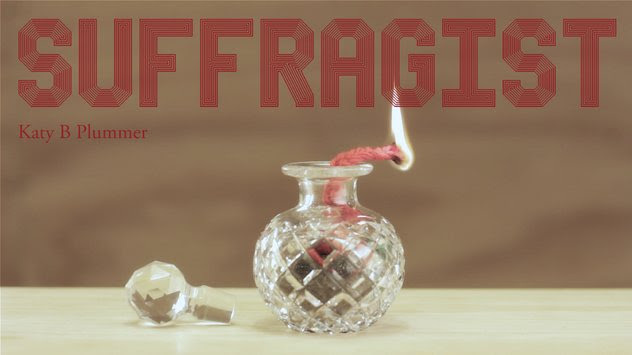 ‘Suffragist’ is a five-minute, single channel video. A Chaplin-like female protagonist—or, better, in the vein of Alice Howell, Norma Nichols, Vivian Edwards or Marie Dressler, to name just a few who co-starred with Chaplin—is awakening to the potential of violent insurrection and the consequences of this in her personal life. The soundscape is necessarily uncomfortable and would be multi-hyphened in any further description. Plummer’s protagonist carries a banner with a smear of paint in place of crest or motto. She also carries a pink club with nails, the modern equivalent to a medieval morning star. Both are props on display. An internal battle is fought against futuristic gamer Halo-like soldiers wearing cardboard armour. The protagonist doesn’t confront them head-on, possibly in the same way that it’s difficult to internalise any new idea. She chooses to flee or outrun them, fighting them off in flight, wrestling with the dilemma: what about violent revolution? And what will this mean for me, my family, my society? The cardboard costumes also serve to remind that the status quo is flimsy and impermanent. The hard part is coming to that radical idea which requires its own internal violence—a creative disturbance, a disruption—to excite change within before it can ripple out into the world. So, here is one answer to the question, what is violence in revolution? Suffragist demonstrates this in itself as a collection of new and engaging art that has the potential to generate disturbance in minds and excite change—no matter how small. Well, this is art. We know new art is violent, or can send shockwaves across family, community, culture and histories. Plummer’s protagonist has her starry awakening. The consequences of her becoming radical are brought into the three-dimensional world with Plummer’s effective deployment of ‘domestic’ crafts (or married womens’ trades, with few exceptions, prior to WWI). They either assist or hamper in her inner and Umwelten battles. Overall, ‘Domestic Insurrection’, the title of one artwork, feels like it’s just the beginning for this emerging suffragette. 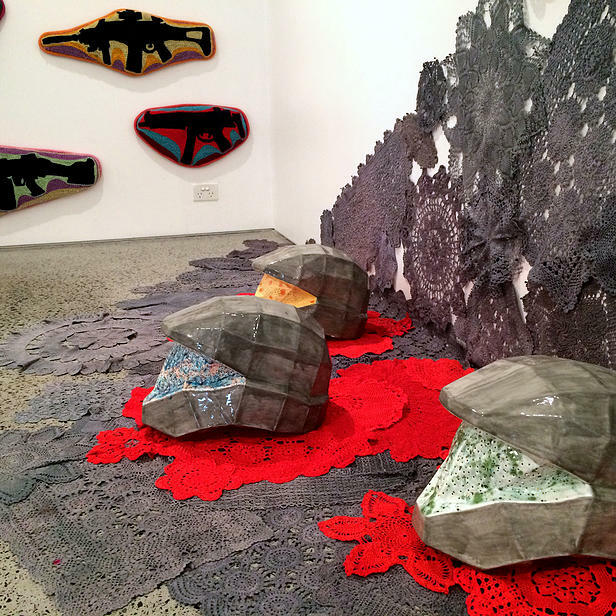 Katy B Plummer, Suffragist, 2015, installation view. Photo curtesy of the artist. Among Plummer’s sculptural pieces are handmade cushions with hand-woven images of a variety of guns situated in womb-like layers. Zombie-grey furniture vibrates, whirls and flashes, and sounds like semi-automatic gunfire. The heads of Halo soldiers lie in pools of red doilies. Plummer’s accompanying sculptural pieces are at once natural and disturbing, things remade to be re-seen—just as the mind draws upon what we know to make violent new connections. But this isn’t necessarily the kind of violence that Plummer wants to address, which can push revolution and change. Suffragettes were successfully rebellious women. They militantly disturbed the status quo and forced cultural r/evolution—at least, in terms of a more inclusive democracy, British women gained the vote in 1918. This makes them successful, but not necessarily cultural heroines. History tends to defang, as Plummer put it, successfully rebellious women. Suffragist gives back to these women something of what was taken away, or reserved only for rebellious men: a rising-hero status with artillery. Forget the fangs. Plummer lays fertile ground for questions around radical politics. What is the potential of violence in revolution? Well, I just have more questions. Why should the oppressed be expected to fight back in a particular way, or in ways deemed acceptable by the oppressors, ways that are usually non-violent? At the same time as my questioning flourished, I came away fantasizing that Plummer had came along with her travelling trunk and popped the lid, that theatrical props and furniture stepped out and plugged in, that homewares popped out and hooked themselves to the wall. This is sometimes the affect innovative work can have, a feeling that it’s material coming forth was magically easy. But, of course, there is much research and time and art making before me. And these resurrected furnishings are by no means benign in the world of Plummer’s protagonist, a newly emerged suffragette.